10 Living Rooms that will Capture Your Heart! The living room is one of the largest rooms in the house. Because of its size compared to other rooms, there is lots to think about when it comes to designing the interior space—there are all sorts of unexpected challenges! Due to the broad size of your living room, you may need to look at specific furniture or consider some mixing and matching. The interior design of the living room also needs to be in line with the decor throughout the rest of the house, besides possibly the bedroom and the kids' bedrooms. Another factor to consider is that the living room should be designed according to our tastes because even though it is a private space, it's where we entertain relatives and friends who visit our homes. This is why today at homify, we are going to look at living rooms that will capture your heart and will leave you itching to decorate and entertain all of your guests! These days, we are never far from a smartphone, tablet or PC, even when we are in the car or going to the toilet—we are always staring at a screen! The more that you live this kind of lifestyle, the more that you realise just how dry your eyes are getting from constantly looking at screens. You may also find yourself becoming a little out of touch with your emotions and your personality. This is why we recommend decorating your living room like a little book cafe, which is plain and simple and yet cosy. This is also a little bit different to the usual living room that just features a couple of sofas and a TV. In this design, we can see that there is a gorgeous light wood design and a built-in bookshelf, which has replaced the traditional television. This is a clean, white colour that matches the walls of the living room. The bookshelf features open shelves, which are two-thirds full of books. The remaining third can be used for ornaments, decor accessories and picture frames. The entire living room room is peaceful and elegant, thanks to the neutral furniture used throughout. 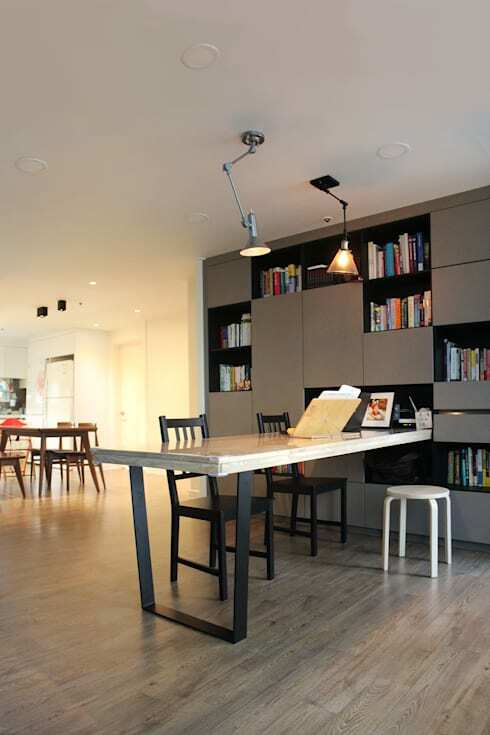 The long lamps that hang from the ceiling complete the look and feel of the space, creating a very modern environment. A fluffy sofa is still a good idea for a living room though! You want a spot where you can truly kick back and relax. Let us look at this Scandinavian-style living room by Toki—a style which has been loved steadily for years. The Scandinavian-style sofa is warm and cosy, setting the tone for the environment. This is appealing as an interior style, especially if you want your living room to feature a comfortable seating area. This type of style is very popular in Nordic countries such as Sweden, Denmark and Norway where there is an environmentally friendly mindset. This is why the house is decorated with natural materials, such as wood and glass, as far as possible. In order to really achieve the Scandinavian look and feel, you must also try and incorporate as much sunlight as possible into the room. Opt for robust furniture of high quality that will last as long as possible. A modern living room can be compatible with all sorts of styles, including Scandinavian-style. You can also decorate a living room with a comfortable seating area and then create a more formal living room, where you can entertain guests. This allows you to still have your cosy, more casual living room as well as a spot for entertaining guests. Furnish your modern and more formal living room with a smart, leather sofa, some side tables and transparent glass or metal side tables. These can create a more clean and sophisticated look in comparison to wooden furniture. Add a few decorative elements such as a simple piece of art or a vase of flowers, which will enhance the furniture. 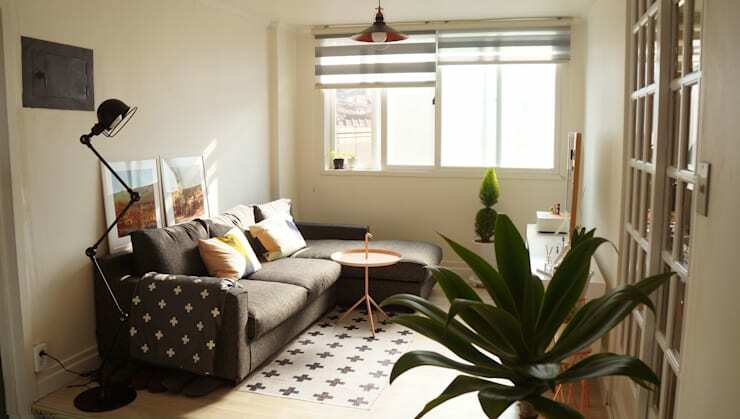 Also have a look at these: 7 ways to save money furnishing a living room. If a house is small, you can incorporate the dining room and living room in one space and still cater to three to four family members. You don't have to worry too much about interrupting each other, for example if one member of the family is eating and the other is watching television. The only time that this would be a problem is during a busy weekend and then you can ensure that you all work together as a family. This is also a far more interactive space! 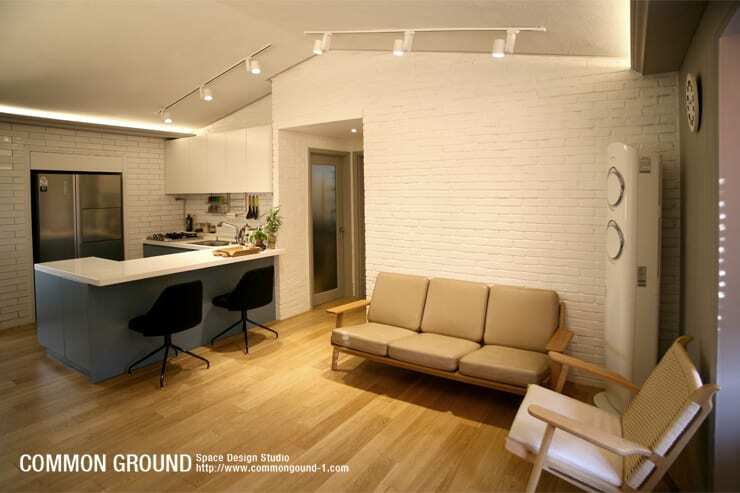 You can also choose how to layout your open plan living space. 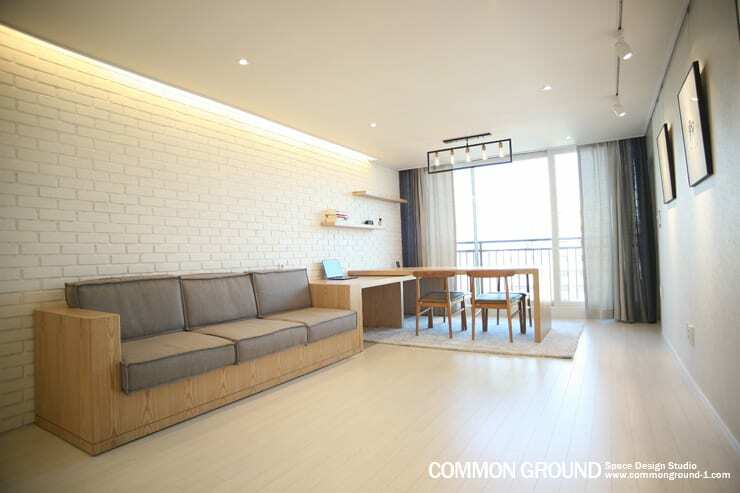 Your living room and dining room can spill out onto a patio or balcony, like in this design by Common Ground, which means you can choose to have your dining room facing the sunshine and looking out onto the views. Or you can place the sofa in a different space in the room so that the warm sun tickles the necks of those enjoying some relaxation. Tip: Whatever you do, add some colourful and cosy cushions to the chairs and sofa to create a bit of warmth and comfort in the space. 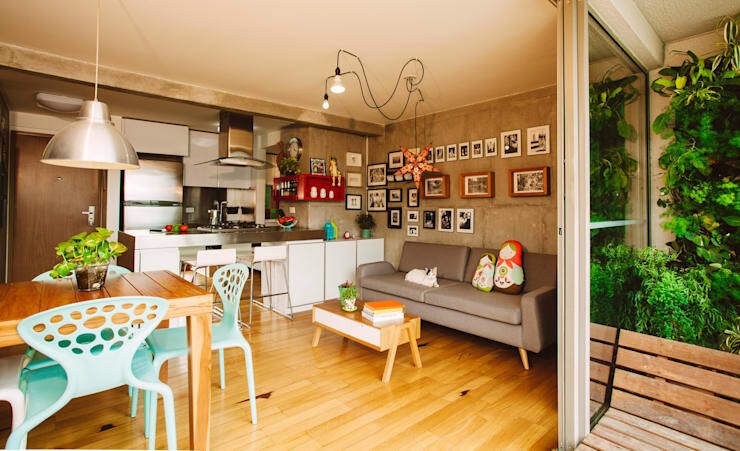 This design shows us how we can get a small home looking that much wider—an open plan design! Open plan means that another room, such as the kitchen or dining room, is opened up without any walls or boundaries, breaking down the visual design space. 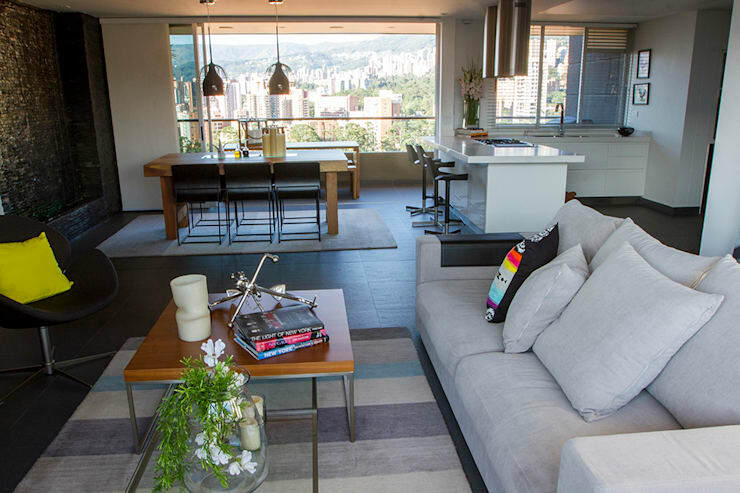 This living room, for example, by Maria Mentira Studios, has a panoramic view of the entire home. The only down side is that if your kitchen or dining room is untidy, it will make the whole living room look untidy too. You can't shove stuff into one room and forget about it! A great idea to keep the rooms separate is to opt for different flooring or place different rugs in each space. You can also utilise bulky items such as sofas or large furniture to divide the space naturally. In tough economic times when everyone is looking for sustainability and environmentally-friendly designs, it's very trendy to live in an industrial chic home where raw materials are completely utilised, rather than replacing and rebuilding homes. DIY, when it comes to clothes, furniture or interior design, is becoming increasingly popular and should be utilised! Paint that brick wall white and watch the incredible results! Working on the floor, furniture and walls in your home can really add a sense of freshness to the space as well as a sense of accomplishment. The industrial look also works with just about any furniture or colours! If you want to paint your walls yourself, remember to do so very carefully and with the right brushes and equipment. Wear gloves and leave all of the windows open for ventilation. If you are tired of the same old Scandinavian or modern style, why not do a full 180 and switch to a completely different atmosphere in the living room? You could create a rustic cottage, reminiscent of a beautiful French villa, like in this design by Casa Calda! You'll see that the living room is meticulously decorated with small items that have been carefully thought out as well as large furniture such as a sofa or table. These large items are recommended so that they complement the smaller items. You don't have to go for elaborate furniture designs. Work with the size available to you in your living room and mix up the layout a little bit. You can also add a friendly and personal atmosphere to the space by including framed family photographs of your favourite memories or little souvenirs from your travels on display. Have a look at these living room products for inspiration. When you have children, you will find that the little desk area for them in their bedrooms becomes insufficient, especially as they get older and study more. They need a private spot where they can focus on their work, which is personal and spacious. The living room sofa may not be the most appropriate space any more! If you choose to convert your living room into a part home office, it needs to suit the whole family. Opt for cupboards as a smart storage solution as well as modern desks in either black or white. Put the desk somewhere neat and out of the way so that it doesn't interfere with the living room flow. You may have accumulated a lot of items since your first home, which is why a spring clean every year is so important! Get rid of old books and clothes on a regular occasion so that your home remains neat and minimalist. 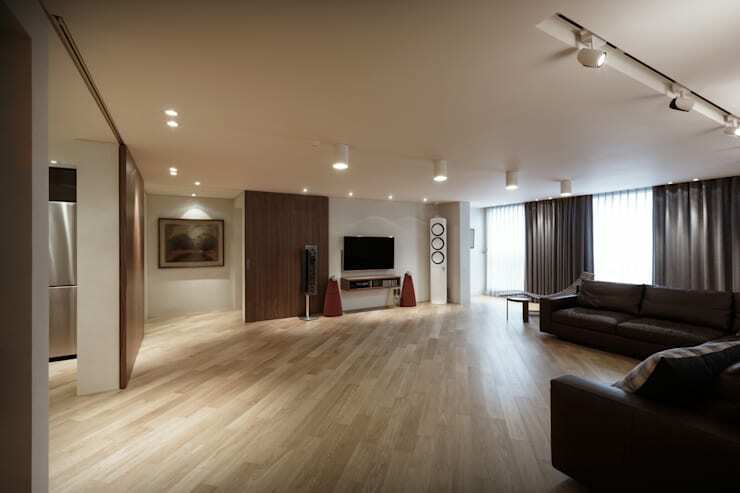 If you are still struggling with space, however, you can utilise the largest room in the house: the living room. Opt for a cabinet, a bookshelf or a storage within the sofas themselves so that you can store items out of sight, without compromising the aesthetics of interior design. Try and store items in the relevant rooms, however, such as kitchen items in the kitchen and clothes in the bedroom. You can also utilise vertical space, installing cabinets or cupboards on the walls. This also leaves more floor space for furniture. Also have a look at how to: Transform an unused room into a walk-in closet. No matter how stylish and trendy your living room is, its value will drop if you do not have proper living room lighting. Lighting should make up 80% of the interior and should have the ability to be turned on to create a bright interior or made dim to create a romantic ambiance and atmosphere. If your living room is too dark or too bright, the whole look and feel will be ruined. If you are only going to install a few lights in the ceiling, go for a light bulb that is a warmer colour. 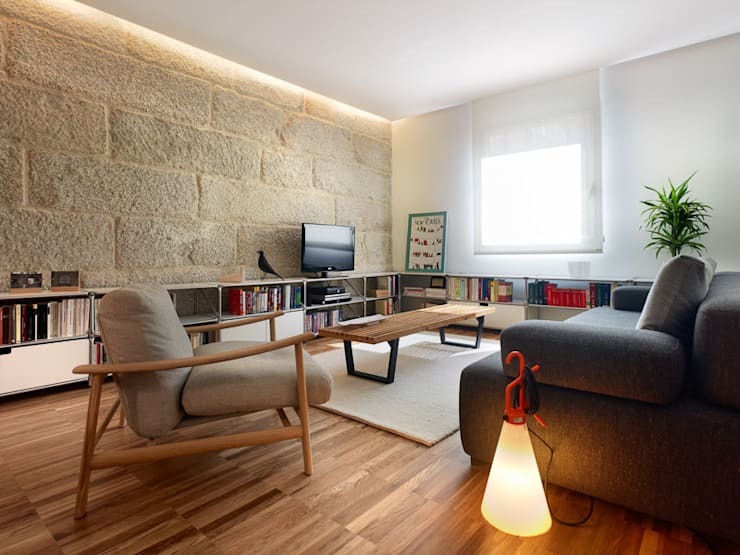 You can also put lamps next to the sofas or place a lamp in the room that has a floor stand. The other option is to drop a a few lights from the ceiling, like we can see in this design. What type of living room works for you?